I distinctly remember trying to figure out how to properly fold and crease my dad’s daily copies of The Washington Post (which he still reads almost exclusively in print). But when I decided to pursue a graduate degree in journalism, I wanted to study the future of news, including alternative revenue sources and audience development. I’ve long been fascinated by the intersection of media and technology, which led me to Northwestern University’s Media Innovation program. I am passionate not only about quality journalism but discovering a sustainable path for its future. As a researcher for the Membership Puzzle Project, I’m looking at what news outlets can learn from other organizations, starting with public media and most specifically public radio. (Television was out of scope for this phase of research.) After combing a sample of 50 public radio sites to gauge how they present membership to prospective supporters, I found that donation is the predominant model. I searched only publicly available information across stations, mostly American and some international, to understand how each is defining membership and how members can be involved. These stations’ sites suggest broadly similar approaches, with membership primarily defined firstly and often only by financial contributions. We call this a “thin” approach to membership, which doesn’t mean it’s wrong--just that there may be opportunities for more interactive approaches. Sites included in the database include local community stations, well-known stations from metropolitan areas, major public radio players including National Public Radio, as well as affiliated stations nationwide that rely on these major players for additional programming. The stations, which vary considerably in size and scope, include a programming mix of local and national news and music. A handful of public radio stations based outside the U.S. are also included, but “public radio” has high variations in levels of government funding across countries, making direct comparisons problematic. This is an open data set, intended to evolve as listeners suggest stations, particularly those that experiment with new forms of membership. You can suggest stations to include here and don’t miss my fellow researcher Anika Gupta’s investigation into the changing face of public radio, based on extensive interviews with staff at nine public radio organizations stations across the United States. “Member” and “donor” language is used interchangeably. There are also regular requests for donation of assets (such as vehicles and securities), corporate sponsors, and employer matching gifts. The factor that varies the most between programs is the type of thank you gifts offered to members at “checkout.” Donors are regularly thanked with physical gifts, including mugs, apparel, CDs, and discount cards. Gifts are fixed to dollar amounts. WRFK’s membership pitch is simple, and the station isn’t trying to sell people on membership for material perks. I saw a few stations that offer members-only newsletters and magazines, which helps to actively engage members with the station on a regular basis. 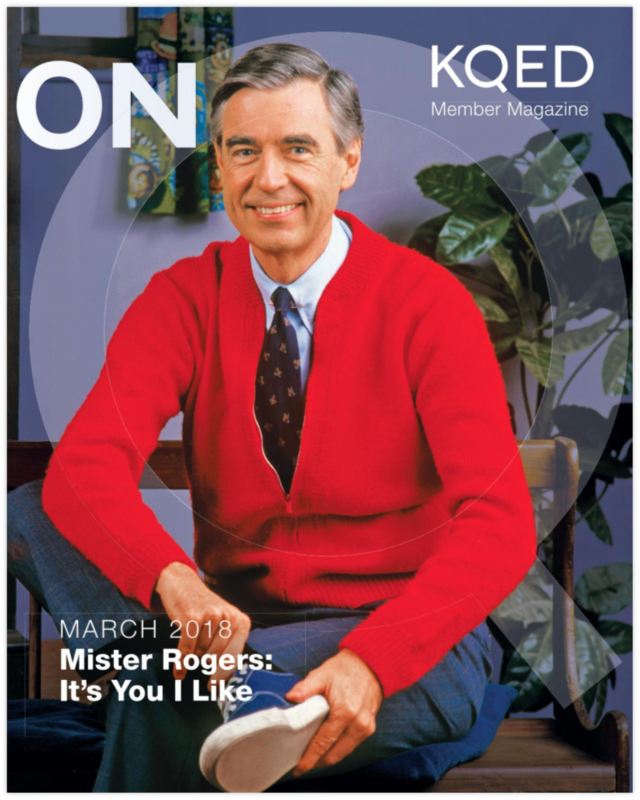 The magazine On Q publishes monthly updates for KQED members. 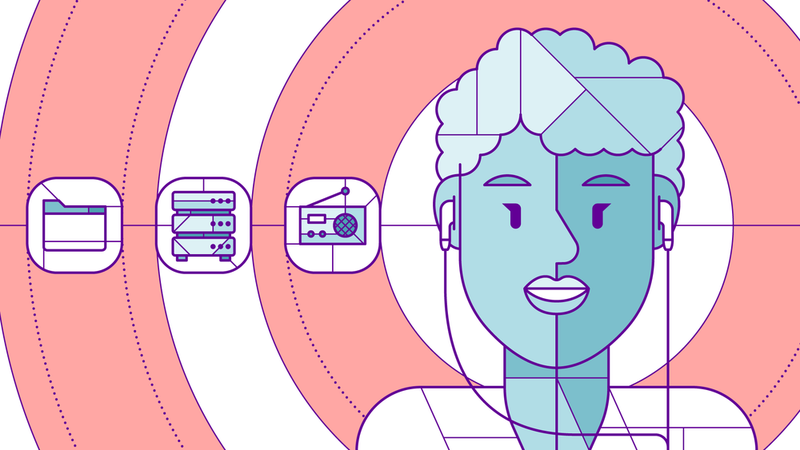 Some stations are attempting to grow communities of younger members who might not engage with radio in the traditional sense via broadcast. New York Public Radio (WYNC) has a membership program for donors aged 21 to 49 called Amps. Members are promised “unique, immersive and deeply New York experiences.” According to the pitch, outings in the past have included stargazing with the Radiolab team and tickets to sold out live tapings. The Netherlands-based Evangelical Christian radio station EO also has a membership program for youth called BEAM. Membership is targeted at young persons who are enthusiastic about the Christian faith, but parents who are members can also sign their children up for an additional fee. Besides attending Christian events, youth members receive BEAM magazine quarterly. This was disappointing. We’re hopeful that more station staff will get creative about how they might strengthen their journalism by bringing listeners closer to the work as sources, volunteer fact-checkers, and more. More than half of the stations make it clear that they offer opportunities to volunteer. Station volunteers are invited to work as membership coordinators and to answer phones during pledge drives, mail thank you gifts, promote the station at events and in local communities, and seek out potential donors. Some stations make more substantive pitches to volunteers. At Minnesota Public Radio (MPR), “volunteer opportunities will be matched to your interest area, availability and skill sets.” Examples of volunteering cited revolve around engaging communities throughout the state and acting as loyal brand ambassadors. Minnesota Public Radio offers a range volunteer opportunities designed that speak to volunteers’ interest areas or skill sets. The National Public Radio affiliate station in San Bernardino, California, has a similar pitch. KVCR recognizes volunteers as the “heart” of the station. Volunteers reportedly “work hand in hand with KVCR staff assisting with duties and assignments that enables KVCR to fulfill its mission of bringing quality public broadcasting to the Inland Empire and beyond.” It does not explicitly reference examples of volunteers working one-on-one with reporters, but the possibility isn’t ruled out, either. KVCR matches volunteers by their talents with opportunity spaces. Whether or not volunteers or one-time supporters are considered members is a murky area for the majority of stations in this sample. Both are regularly included under the umbrella of "support." Using American Public Media (APM) as an example, there is a “support” page that provides information about “sustaining memberships,” a model public radio sites frequently used in the database. There is a place for “individual support” on the “support” page (or in other examples, a “one-time contribution”), but it is unclear whether these donors are considered members. American Public Media characterizes donors into individual supporters and sustaining members, but it’s unclear whether individual donors are considered members. At Indiana Public Radio (WBST) in Indiana, “basic membership” is defined through donation. A minimum donation is not explicitly stated for membership, yet only donors who pledge $100 receive a “member card.” I found minor discrepancies like this throughout my research. I found that the public radio stations I looked at in the Netherlands most clearly identified guidelines for membership. At WNL, which produces television and radio programs through the Dutch public broadcasting system, members pay 5.72 EUR annually. Members can only become a member once, must be confirmed by WNL staff before membership is confirmed by a council of members, and can be disqualified at any time. Most sites have tiers of membership according to the amount donated:. Almost all non-tangible benefits are offered to members paying more than $1,000 in a given year. (Most memberships resulting from a one-time donation included membership for one year.) These benefits include meeting with reporters or on-air personalities, touring the station, or attending member-exclusive events. 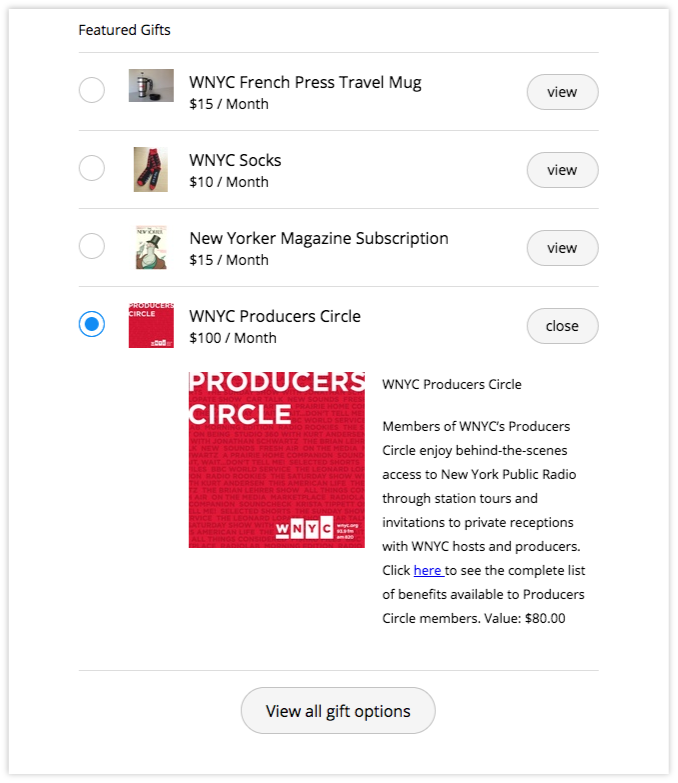 Members who donate $100/month are entitled to special perks at New York Public Radio (WYNC). Political: Public radio is being threatened. Altruistic: Highlight the value of public radio and importance of local journalism. Straightforward: Members are the station’s main source of funding. Plus members get these perks. A community-minded approach to attract members, like this one from Houston Public Media, is popular among the stations examined for this study. An example of a straightforward membership pitch from WGBH. You can explore data from all 50 radio stations in our database here. And if you know of other stations you think should be added, we’d love to hear from you. Let us know using this form. Jessica Best, Emily Goligoski, Leon Postma, Jay Rosen, and Gonzalo del Peon contributed to this post.